Why Cheap rather than Green? Easy! Cheap is far more Green than “Going Green” will ever be. Let me explain. When people talk about “going green”, in their mind they are thinking large-scale windmill farms, reusable grocery bags, Energy Star appliances, hybrid cars, fancy greeting cards made from elephant dung, using the blue recycle bins, supporting World Wildlife Federation, and maybe voting for the Green Party. They might even go as far as replacing some of their light bulbs with compact fluorescent bulbs. When I started this article I spent some time checking out some of the “Green” websites to see how they defined “Green”; to see what activities, actions, and ideas they were promoting. While it was difficult to get a definitive answer, the general understanding of “Being Green” is to pick products that are less harmful to the environment and to preserve the natural resources. I also discovered that while there is endless talk in the media about Going Green, the evidence suggests that for all the hype and the community recycle programs, current trends indicate that, rather than reducing, we are wanting and using more and more. The average size of a home in America has more than doubled since the 1950s; it now stands at 2,349 square feet. Nielsen Media Research tell us that we now have more televisions in the average home than people, with half the homes having 3, or more, TVs. The average consumer spends about $725 per month on transportation, with less then 9% driving mini cars or hybrids; average miles driven per capita has gone up nearly 700% since 1960, with commutes getting longer and longer. In 1960, the average American threw away 2.7 pounds (1.2 kg) of trash a day, according to the Environmental Protection Agency, today the average American produces about 4.4 pounds (2 kg) of garbage a day, or a total of 29 pounds (13 kg) per week and 1,600 pounds (726 kg) a year, not counting industrial waste and commercial trash. This is in part due to the huge increase in disposable, single-use items, ranging from razors to fast-food take out containers. Having said that, 74% of the population recycles to some degree, though there is still enough aluminum thrown out every month to rebuild the entire commercial air fleet. The mantra of the Green Movement is “Reduce, Reuse, Recycle”. These are the basic ideas of being Green. Guess what, we have always gotten by on the least amount, used everything over and over, and been recycling (pop-bottle deposits, thrift stores, yard sales) for longer then I care to admit. Years ago, Barbara Mandrell had a song that said, “I was country when country wasn’t cool.” Well, I was Green before Green was cool. Back then we just called it frugal, tight-fisted, economy minded, broke, or just plain Cheap. The first step in being Green is to reduce what you use. As a Cheap-O, I reduce to save money, not just to save money but to not spend money, to get more value out of every dollar I have to spend. To make my money work for me, two, or three, or more times. First and foremost, the best way to reduce is to very simply turn things off. Don’t turn the lights on until you need them. Use power-strips to completely turn off TV, stereo, DVD and VCR players, microwaves – any appliance with a digital display uses power all the time not just when you are using it. The same is true of anything with a remote, they use up to 80% of their operating power when they are sitting on standby. The way to eliminate the power drain is to un-plug or use a power-strip to completely shut off those things. Nationally, these energy “vampires” use 5% of the domestic energy and cost consumers more than $8 billion annually. We turn off the lights when they aren’t being used, all of which are compact fluorescent lights. Our night lights are LED that use 1/2 watt each. We don’t have cable or satellite TV. Heck, our TV and DVD player are not even plugged in. We have down-sized, gone from a 60-gallon, electric hot water tank with two 3,000-watt elements to a 30-gallon hot water tank with one 1,500-watt element (this can also be listed under “Reuse” as this was a used hot water tank when we put it in, and it was free). 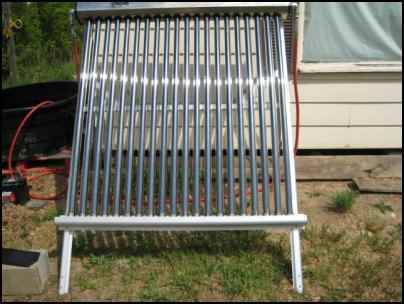 We have also added a solar hot water heater, to use even less electricity. We have given up our 17-cubic-foot fridge and gone with a 3.5-cubic-foot fridge that will use about 60-70% less power. We hope to eventually go to using a cold room and eliminate the need for a fridge altogether. We rarely use our range for baking. As soon as you turn on the oven you are using 3,500 watts, 4,000 watts if you use the broiler. We use a toaster oven which only uses 1,500 watts, or a portable roaster which uses 1,800 watts. Or even better, we use a slow cooker which only uses 200 watts. We buy in bulk to save packaging – everything from soap to grains to food stuffs. We combine trips to town so that one trip does 4 or 5 errands; as often as possible, we only make trips to town when we have to. When going to work I make sure to utilize those trips to take care of business and groceries, etc. We keep the tires properly inflated. It is estimated by www.planetgreen.discovery.com that if the tires on every American’s car were properly inflated we could save around 2 billion gallons of gas each year! We wear our clothes more than once before they are washed (with the exception of undergarments and socks). According to The United Nations Environment Programme, you consume up to five times less energy by wearing your jeans at least three times before washing, washing them in cold water (90% of the energy used to wash clothes is to heat the water) and skipping the dryer and the iron. Our dryer is a clothesline in the summer and a clothes rack in the winter. (There are an estimated 88 million dryers in the United States each producing more then a ton of carbon dioxide per year). An added bonus is that clothes last longer when dried on the clothesline than when dried in a dryer, as there is less wear and tear on the clothes. This also eliminates the need for dryer sheets and the cancer causing chemicals and the neurotoxins such as toluene and styrene. We have reduced the number of cleaners in our house by using an organic, vegetable-based, unscented cleaner, and using it for just about everything. Laundry, dishes, shampoo, shaving soap, household cleaner. We reduce our water usage by capturing rain water to use to water lawn and garden. 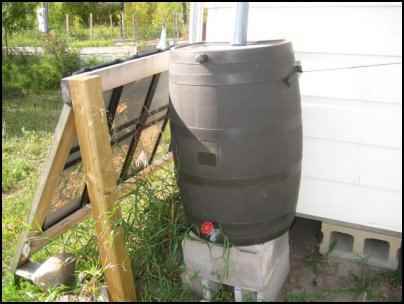 The rainwater is better for the garden than well water and does not have the chlorine that city water has in it. Every thing has a second, or third, or fourth life. Wood pallets become building material (http://summerville-novascotia.com/PalletShed/), wood for woodworking projects (some of the pallets are made from hardwood) or fencing or fire wood. Tin can lids become Christmas decorations or craft projects; kitchen scraps become compost; glass jars become canning supplies or a canister set; salvaged building supplies (doors, windows, bricks) become new building material for sheds, shops and chicken coups; burnt-out light bulbs become Christmas decorations; empty plastic milk jugs are cut up to become stencils or patterns for craft projects; old jeans become new fashions for the grandkids until finally they become cleaning rags; newspaper becomes Papier-mâché for craft projects, packing material, or fire-starter; 2-liter pop-bottles become bird feeders or yarn holders; an old metal barrel is going to be used as part of a outdoor oven; a stock tank is used as a hot tub; old bed frame rails become fence posts; old milk cans, cement blocks and old tires become planters; old printer sheets become metal roofing for a shed; yogurt tubs become freezer containers, cardboard is used for more stuff than I can count; whatever burnables that you have – junk mail, the envelopes that bills come in, cardboard scraps, this, that, and the other thing – go in the wood heater to help heat the house, and stay out of the landfill. Even the much maligned plastic shopping bag is reused for a variety of things, not the least of which is cutting the bag into strips and using it to knit slippers or reusable shopping totes. Check out http://www.allfreecrafts.com/ for ideas and patterns. Everything has (at least) a second life. The vast majority, if not all, of our clothes are bought at the thrift store, giving additional mileage to someone else’s used clothing. The wife and I combined, spend a tiny fraction of the national average of $1,188.00 per person, per year, on apparel. Thrift stores also provide used furniture, books, and household items, all of which didn’t end up in the local landfill. Yard sales are like going on a treasure hunt. 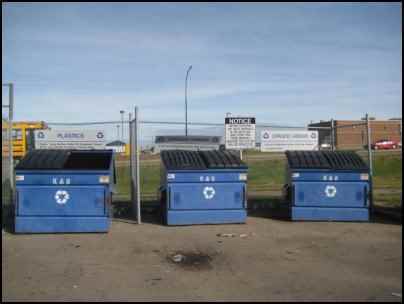 They are recycling at its best. One man’s junk becomes another man’s treasure. Our home is furnished in “early yard sale”. The last several projects I have done, I have obtained the paint free from the bottle recycling company as they also handle recycling paint and electronic composites. This helps reduce the amount of things going into the landfill, and provided me with good quality paint at the best of all prices, FREE. Freecycle.org, along with several other organizations, offers the means to recycle everything from patio blocks to books, from children’s toys to computers and T Vs, lumber to clothing and more. Our community has recycle bins at two of the local malls. We have found that we don’t use these very often as the things they recycle – paper, cardboard, glass – are things we use over and over again. 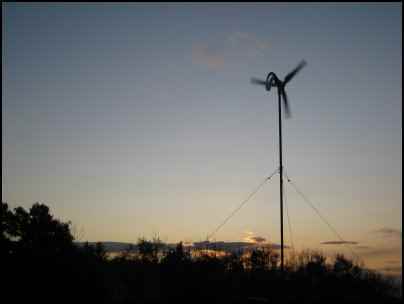 We have taken the next steps and gone to generating our own power with solar panels, a wind generator, and a solar hot water heater. 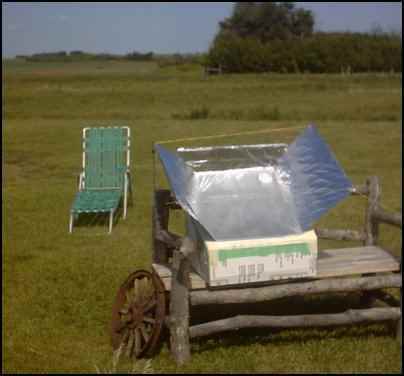 We have even played around with solar cooking, which uses zero electricity and is fun besides. The thing is that we always look for ways to not just save money but to avoid spending money. To not have to earn the money in the first place. Homesteaders, as a whole, are more aware of the environment than most people, as we have to live and work hand-in-hand with nature. 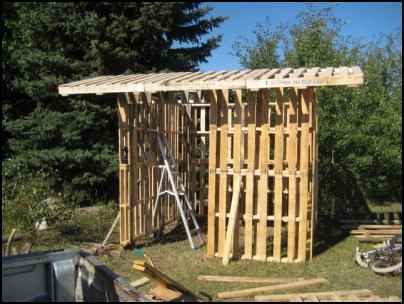 Being a Cheap-O and a homesteader, not only do I want to live in harmony with nature, I want to do so in the cheapest way possible, while making the best use of all our resources. Now the net result of our cheapness is that I am “Greener” than my friends who proclaim that they are “Green”. I do more for the environment than the tree huggers. I could be a poster boy for the Reduce Reuse Recycle program. Those are just some of the side benefits of being cheap. If you are worried about the environment then don’t think “Green”—think cheap. If you are worried about the way the economy is going—think cheap. If you are worried—think cheap—live cheap. Cheap (Green) and proud of it! Once upon a time I wrote an article with the same idea. I was frugal when frugal wasn’t cool and frugal is greener than green most of the time. Jan R CookeJan R Cooke did a super job saying that. I appreciate these articles so much!